Professor Joanne Anzenberger is a veteran police officer of nearly thirty years and a Criminal Justice teacher here at Housatonic. Since the age of twelve, Anzenberger hoped to one day become a teacher and not only hopes to educate her students on the letter of the law and how to become police officers, but also educate and encourage them to find careers in the fields she does not even teach. 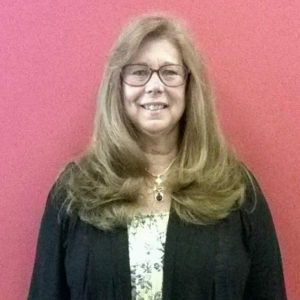 Before becoming a teacher, Anzenberger was a police officer for the Stamford Connecticut police department where she began her career in 1980. She would eventually begin her practice in teaching in 2001 when she began working for the Police State Academy, where she would teach up-and-coming officers along with officers that had been working in the field even longer than her. She described the experience as more “involved” as not only was she teaching students, but she was also teaching people she would have to work with. Photo courtesy of HCC web site. In 2003 Anzenberger began to teach at Housatonic as an adjunct professor in Criminal Justice, and by 2006 she had fully transferred into a full time professor at the school. In 2007 she left teaching at the academy and returned to regular police work and for the next year would continue to work two full time jobs as both a police officer and a teacher for HCC until 2008, when she retired from the Stamford Police Department after 28 years of service. As a teacher she hopes not to simply teach her students on how to become police officers but also teach and encourage them to look beyond that. She promptly hopes and encourages students and non-students alike to take tests like the one the Bridgeport Police Department is having right now; even if they have not yet received a degree in Criminal Justice and if they are not even looking to achieve a degree in the subject but in something else. She is confident that police departments are looking for a lot more than knowledge of the law, but also experience in computers, advanced math and even in engineering as all can vastly help the ever evolving environment police officers work in.